1. 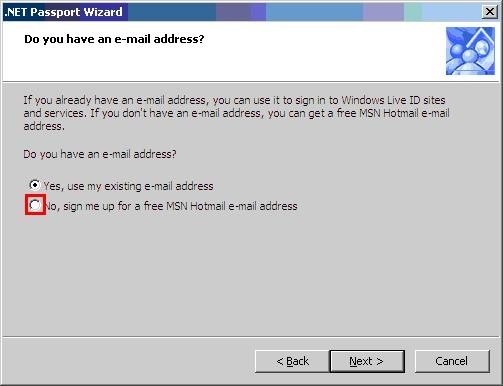 If you have Windows XP on your office computer, we can use MS-Messenger “Application Sharing” to provide immediate live assistance with computer problems in remote parts (also useful for collaboration with colleagues on documents, including web pages, when a phone call is too little and a meeting is too much). 2.4.3. 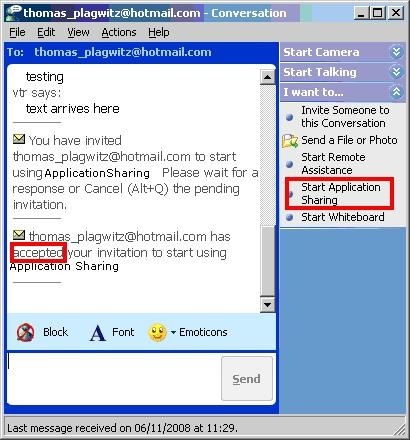 All is well if the other party has “accepted your invitation”, like above – allow some time for the screen sharing to start up on old computers. 2.4.4. 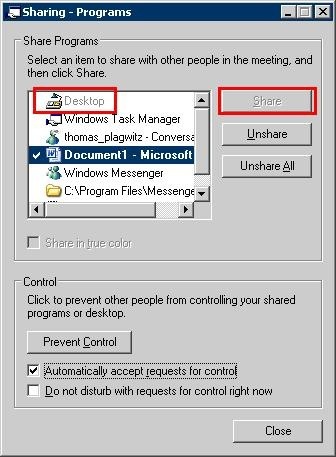 When a dialogue comes up which asks you which application to share, use “Desktop”, like below – this will allow the other party to see your screen. i should probably step further away from implementation details, but i am looking for an anchor in a field which is heavily in flux, and in an environment which seems opaque. existing solutions: seem to be a superficially adapted/integrated application of existing video conferencing implementations for business meetings (Polycom VXS 7000 based?). I have seen academics complaining about “the emperor’s new clothes” when it came to teaching with technology innovation that made much more sense to me than this one, so i am concerned what will be the uptake once the hype is over (Yes, you can video conference over the internet. And for quite some time now. My 70-year old mother calls me every Sunday night on Windows Live Messenger. But we do not do interpreting training in an educational business environment). live video from the speaker is not needed: there is no interaction between the speaker and the interpreter and (practically? sometimes it is recommended that the interpreter can visually sign to the audience) no visual interaction between the interpreter and the audience. if the video of the speaker can be launched to remote sites (streamed or downloaded as an archived file), only audio connections are needed. UK educational institutions appear to be entitled, for instructional use on premise, to record and archive digital video, including movies, as long as it has been transmitted publicly over-the-air. This should constitute a nice window of opportunity (compared with this in the US: http://arstechnica.com/tech-policy/news/2009/05/mpaa-teachers-should-video-record-tv-screens-not-rip-dvds.ars) for creating an enriched archive of language teaching materials, even if you are restricted to consumer-grade means. 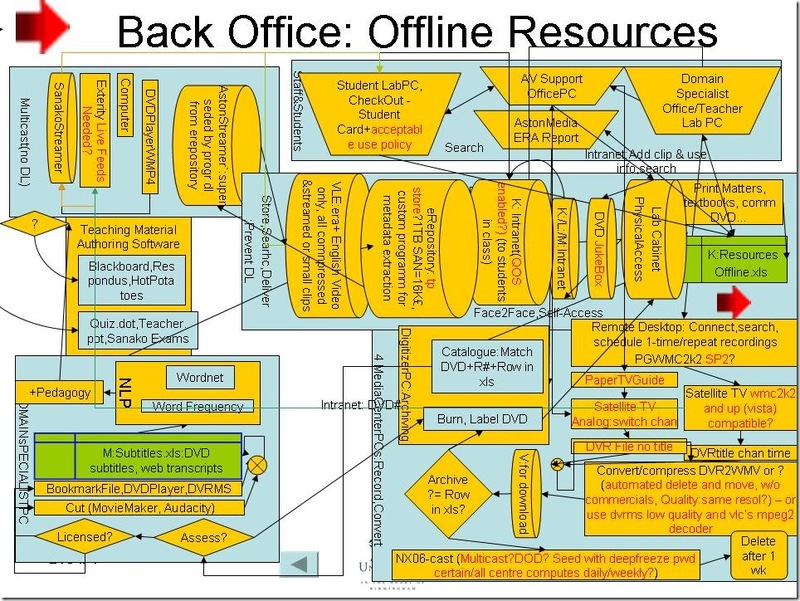 Here is a schematic of such a solution. A common request in second language teaching institutions is persisting internet-based streaming video for instructional (re-)use (during exercises and assessments, which then makes greater time investments into pedagogical additions viable). Even though we found a different (built-in) solution for the European parliament video clips, I am still experimenting with downloading interpreting and subtitling exam or exercise video clips from other, not as instruction-friendly internet sites. Many instructors use youtube.com which does not provide such a download option out of the box. We would have to carefully consider copyright and licensing issues for subtitling movies, however, news items like in the example seem less problematic. UK educational institutions have the right to record and archive, for teaching use on premises, public over-the-air broadcasts – including of movie materials. However, to set up such a Freeview/Satellite-TV recording and archiving solution this would require a considerably higher initial investment. Replay Media Catcher can record flash video, .FLV streams and audio, as well as .MP3 streams through the RTMP and HTTP protocol, also " QuickTime (HTTP). 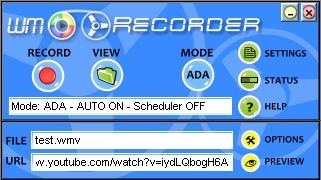 WM-recorder can record windows media streams. I am still having best results with WM-recorder, which I first saw in action at the SEALLT in Dallas 2006. I am still using the demo version of 1.1 which comes with restrictions (5-minute recording limit? The recorder asks regularly for being restarted, but I seem to manage to record longer clips within one session, see example?). Start wm-recorder, open a youtube.com video in Internet Explorer, wm-recorder automatically starts recording to a FLV file (flash video – you may need a media player, VideoLan should help). 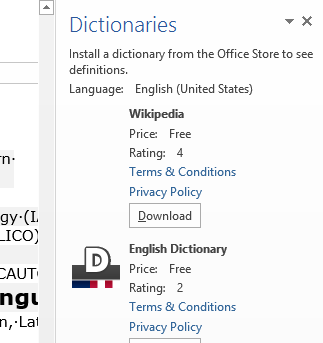 Default output directory is in a subfolder "Recordings" under the program installation folder. You may want to alter the defaults under the "settings" menu. Entering a youtube-URL and filename manually and pressing "record" button in the wm-recorder interface strangely enough fails. 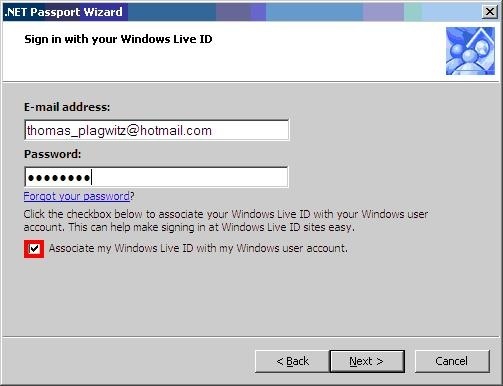 Group members can access an uploaded output sample in the hale-interpreting.groups.live.com: http://cid-0009a5a00a54c045.groups.skydrive.live.com/redir.aspx?page=self&resId=9A5A00A54C045!150 (Interested parties who still have no access can log-in with the windows live account and ask for an invitation). You can compare the (apparently equivalent) source quality here: http://www.youtube.com/watch?v=DEGd75awApM.